Explaining energy healing to people who are unfamiliar with it can be difficult. For many people it's a very different way of looking at things, which makes it hard to put into words. You have to quickly orient them to energy healing's different perspective, without overwhelming them with Too Much Information. I've spent a lot of effort trying to come up with written words that can help people understand energy healing. My whole website is part of that effort. I thought I might save others some of their own bumbling around by sharing the little speech that I've developed to explain energy healing. I made a flow chart to help. I hope you can read it. The words in the flow chart are repeated in narrative format below it, in case it doesn't show up in your browser, or if the words aren't legible on your screen.There's also some additional wording that wouldn't fit on the chart. Here's repeat of the flow chart, in case you can't read it on your browser or screen, plus some additional verbiage that wouldn't fit in the chart. Other Person: What do you do for a living? Me: I'm an energy healer. Other person: (looking at me blankly) What's that? Me: Energy healing is a form of holistic therapy. Reiki and Healing Touch are forms of energy healing, if you've heard of those. Other Person: Oh, YES, I have heard of Reiki. Me: OK, Reiki is one kind of energy healing. There are different kinds of energy healing, but they all have the goal of helping you be healthier and happier, and they all believe that there's more to you than just your physical body. In other words, we energy healers believe that you are more than just a pile of chemicals, or a machine. Energy healing works with these non-physical aspects (which we call "energy" or "energy field," but others might call life force, spirit, or chi). So when a client comes in to see me, I talk to them for a while to find out what their issues and goals are, then I have them lie down on a comfortable massage table. 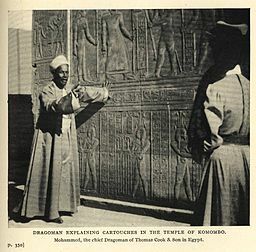 Depending on their goals, I might gently touch their physical body in certain places, or I might just work with their energy field, without touching their physical body, to influence it to be more harmonious, flowing and balanced. Sometimes people experience physical or emotional healing or relief, sometimes they have insights and understandings that help them in their lives. Almost always, they become very, very relaxed, which in itself is very good for their health. Person: NO, I haven't heard of Reiki. Me: Have you heard of auras or chakas? Me: Well, auras and chakras are part of your energy field -- the invisible foundation of your physical being. As an energy healer, I work to influence your energy field to help it be more harmonious and flowing. This helps you be healthier and happier. As before, if they continue to look interested I might describe how a session with me would look. Person: NO, I've never heard of auras or chakras either. Me: OK. Energy healing is a form of holistic therapy. Energy healers believe that there's more to you than just your physical body. In other words, we believe that you're more than just a pile of chemicals, or a machine. And energy healing works to influence these non-physical aspects, which we call "energy," to help them be more balanced and harmonious. This helps your physical body and mind be healthier and happier. It's very gentle and relaxing, which in itself has a very healing effect. I hope this is helpful. You can use this if you want, just give me credit if you use it in writing. 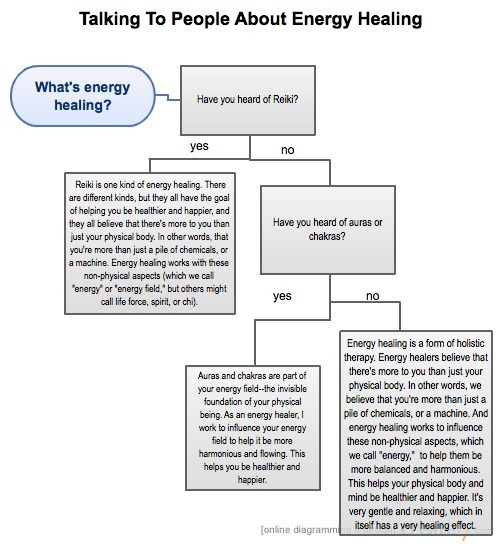 How Do YOU Explain Energy Healing? 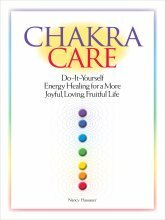 How do YOU go about explaining energy healing in a short conversation or written passage? Scroll down a bit to use Facebook Comments to share how you do it. Go from Explaining Energy Healing to Energy Healing Basics main page.